Greek Easter falls this Sunday and we hope to be heading into London to meet up with family for the service and a big family picnic. If you’re wondering why the Greek Easter falls on a different day, it’s down to it following the Julian calendar rather than the Gregorian. 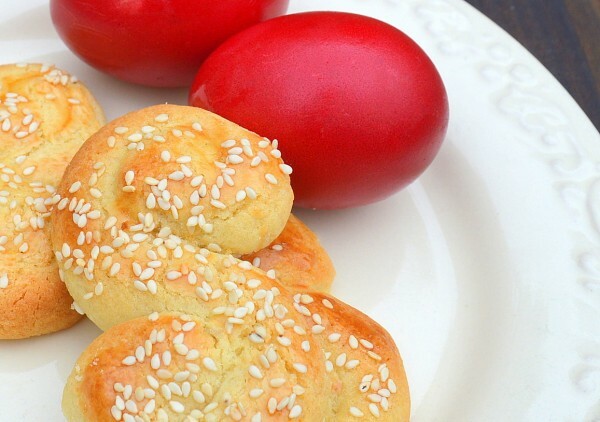 You can find out more over on our recipe page for koulourakia – the mouthwateringly more-ish Greek Easter Biscuits. 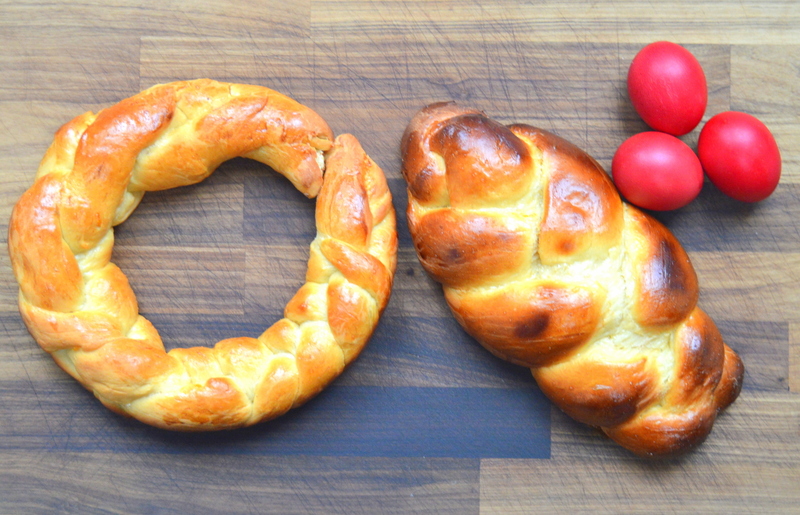 Today I’ll be sharing a recipe for tsoureki which is the traditional Greek Easter bread. Its wonderful flavour and aroma comes from using two spices – mastic and mahleb. 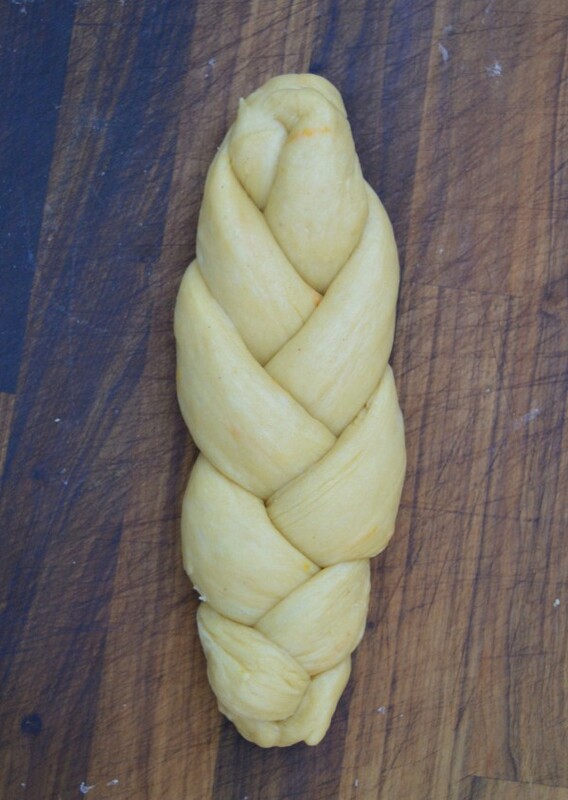 The bread is traditionally shaped into braids either as a loaf or into a wreath. Sometimes the red-dyed, hard-boiled eggs are placed onto the bread – the dye symbolising the blood of Christ and the egg itself symbolising new life. This recipe makes 3-4 loaves. The dough requires two risings so make sure you leave plenty of time before they are needed. In a bowl stir together the lukewarm water, yeast and a teaspoon of sugar. Cover the top of the bowl tightly with clingfilm and set aside for 5 minutes in order to activate the yeast. You’ll see it froth and bubble as it is activated. Ensure the water is lukewarm; too hot or too cold and it will kill the yeast. Using a pestle and mortar grind the mastic and mahleb together until it becomes a find powder. Enjoy the aroma! Melt the butter, sugar and milk together. Ensuring the mixture isn’t too hot – it should only be warm enough to only just feel if you stick your finger in – add the 4 eggs and whisk in. Once whisked add the activated yeast mixture. 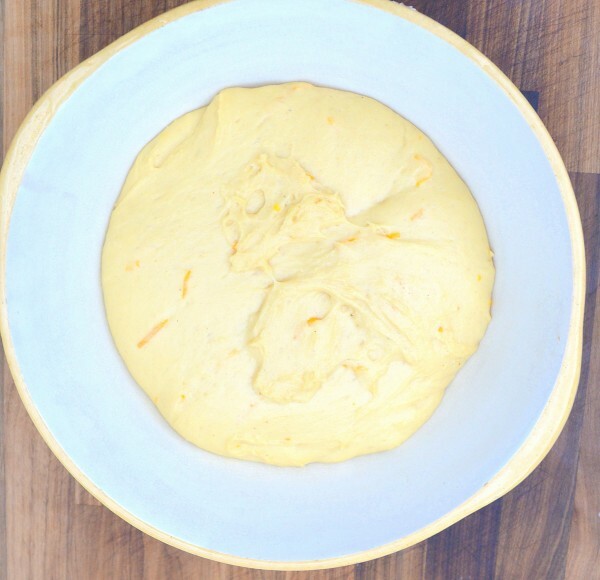 Place flour, the ground spices and the zest into a mixing bowl or mixer and stir in or mix on a slow speed setting using a dough hook. Add in the liquid mixture and speed up the machine in order to combine the ingredients. Allow the machine to work on the dough for at least 12-15 minutes so that it becomes soft to the touch. If it’s still sticky, that’s good. DO NOT add any more dough to it. You want a soft, sticky dough for this bread. Cover the dough with clingfilm and set aside in a warm environment for 2 or 3 hours until doubled in size. After this time, divide the dough into 3 or 4 pieces. Taking one piece at a time, divide it into another 3 pieces. Now start on creating a braid. 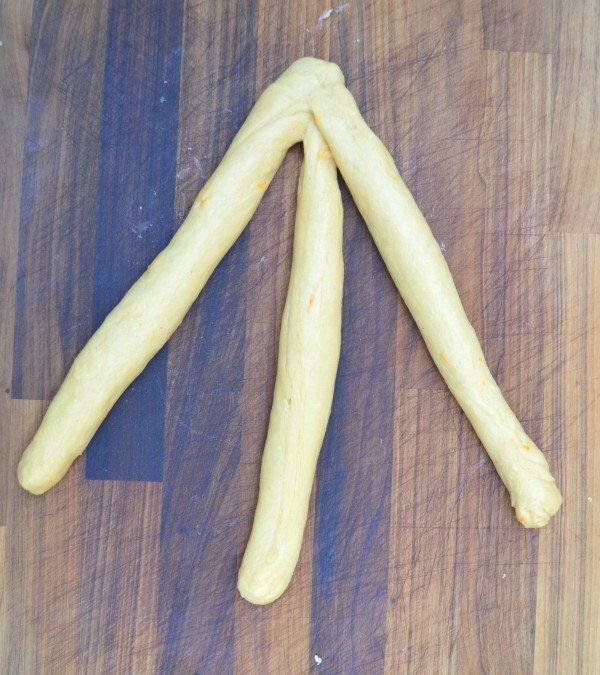 Roll each piece of dough out into a long sausage shape and set out as shown, pinching them together at the top. 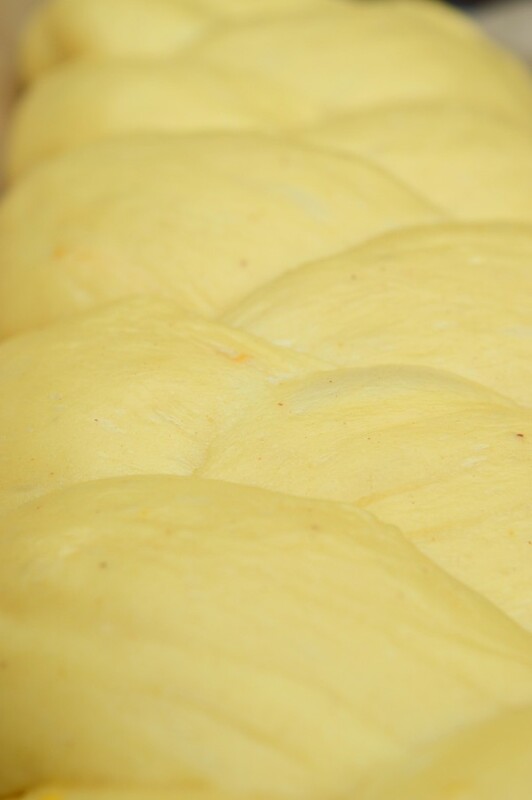 Make sure your lengths of dough are about the same size. Braid the pieces and pinch both ends together firmly to secure. As well as a normal loaf you can also create a wreath shape. 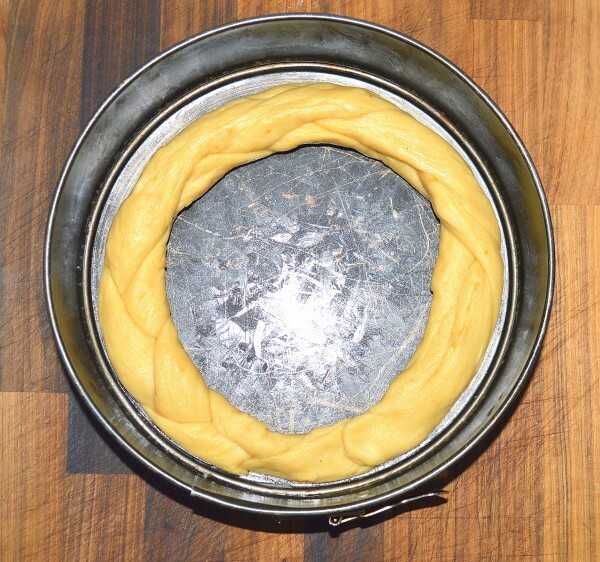 For a wreath you can use a cake tin to help keep its shape. Leave the loaves to rise for another hour or so. Once risen brush with the three eggs to glaze then place in the oven. Bake for approximately 30 minutes until the loaves are golden brown.